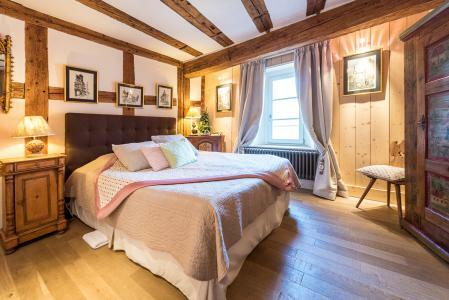 In Riquewihr, a picturesque medieval village in Alsace, our self catering apartments and gites are located in historical National Heritage houses but offer all modern comfort in a charming environment. 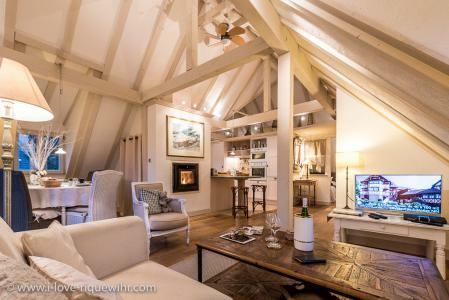 Here the beautiful living area of the White Stork ***** gite. Riquewihr in Alsace was elected MOST BEAUTIFUL VILLAGE in FRANCE by the Japanese travel professionals (January 2016). 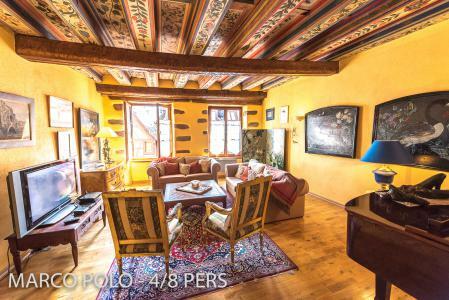 Stay in one of our charming self catering apartments (in France we say gite) and the colourful half timbered houses of Riquewihr will become part of your environment! Riquewihr and the medieval city wall. 7 of our romantic holiday apartments are directly part of the medieval ramparts. Picture taken from the Schoenenburg hill, a world famous vineyard. Riquewihr in the upper part of the main street with its famous medieval Dolder tower. Our holiday rental apartments (gites) are all within short walking distance from the tower. Riquewihr is the perfect base to explore the vineyards of Alsace but also the nearby Germany and Switzerland. Riquewihr in Alsace is a beautiful medieval city, protected by 2 belts of ramparts. Here, 3 of our 15 vacation rentals are part of the rampart built in 1500 (see roof and attic window near the tree). 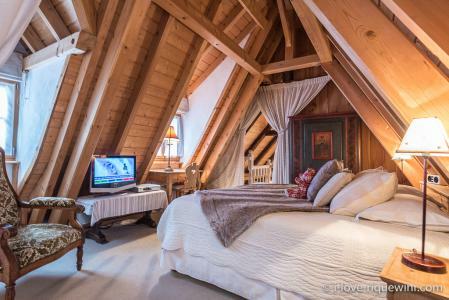 A very unique spot for a very romantic holiday in Alsace! 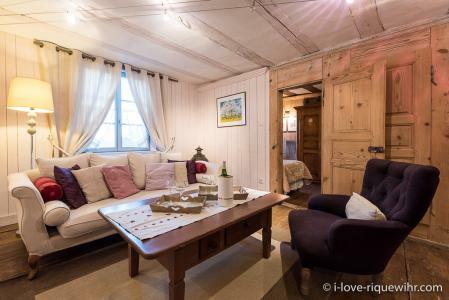 Our vacation rental apartments (gites) in Riquewihr are very special places to stay: a perfect combination of Alsatian tradition and modern comfort. Here you see the master bedroom of the Dove's Nest, a spacious self catering house. 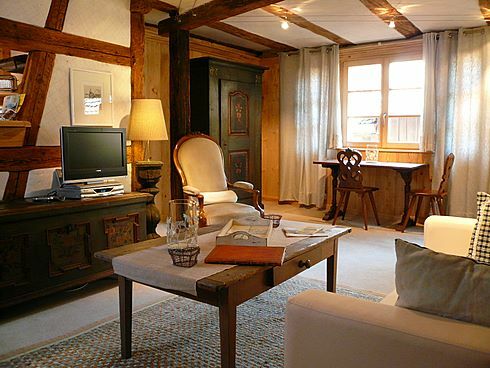 Riquewihr: the lounge of The Sentinel ***** apartment. Big or small, our apartments are beautifully equipped and decorated and will offer you a comfortable rest after a busy day. 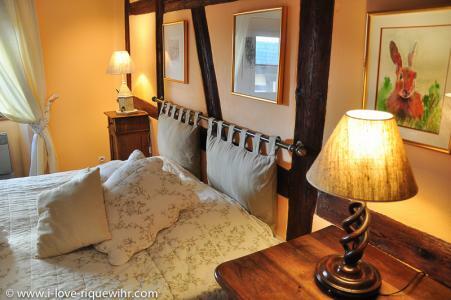 Just to make your stay in Riquewihr and Alsace even more memorable! Riquewihr is a jewel on the Alsatian wine route, nested at the bottom of the Vosges mountains and surrounded by some of the most famous vineyards in the world. 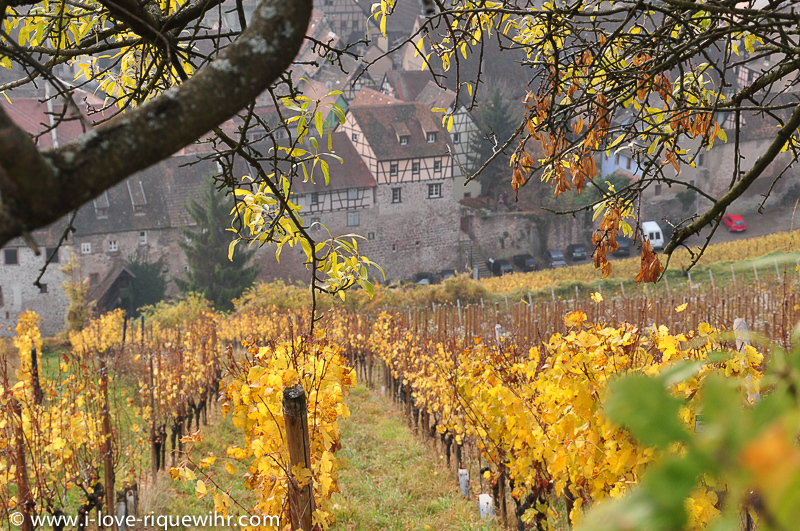 Riquewihr is especially beautiful in Autumn when the vineyards and the mountain wear their golden dress. 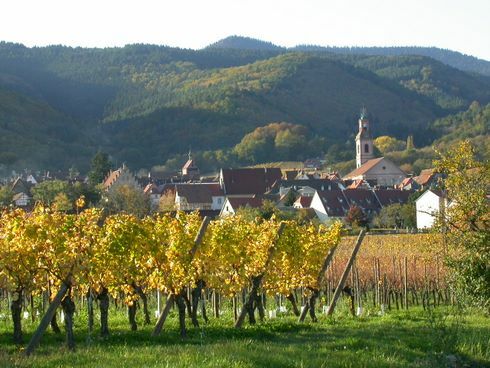 Riquewihr is a wonderful base for visiting the whole region, Alsace and nearby Germany. Take advantage of our special offers for stays until mid-JUNE. Our OLD WINERY Property facing the vineyards! 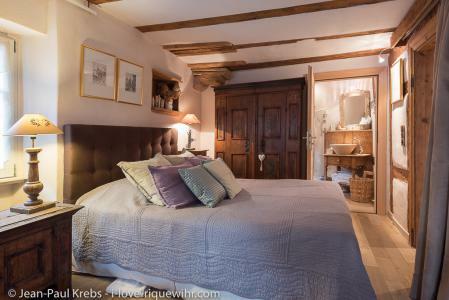 The "Old Winery" is a collection of 6 outstanding romantic and luxury holiday homes: 4 of them are located in a big Renaissance house (actually a winery built in 1580) on the first belt of the ramparts (built 3 centuries earlier in the year 1291). 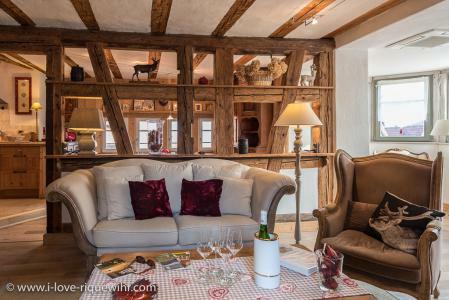 The property is facing the famous Schoenenbourg Grand Cru vineyard producing some of the best Alsace wine; 2 other apartments are in a 17th Century adjacent house. The houses are surrounding a small garden. The Old Winery just earned (2016) a Golden Award for the quality of the renovation works. Why rent a holiday home with us? 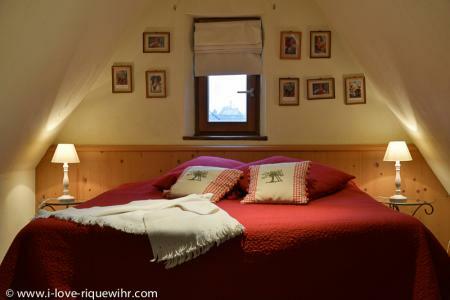 Our guests believe that our charming gites (the French word for vacation rentals or holiday homes) in Riquewihr belong to the finest places to stay in Alsace. We offer several beautiful apartments for rent in a historical and unique environment. Our holiday homes in Alsace are available for self catering holidays all year round. All our holiday apartments in Riquewihr are within a short walking distance (see map on HOW TO GET THERE page and zoom in for the village map), so that it is easy for larger parties to remain all together within a same area. For our guests looking for a bed and breakfast service or even half board (including dinner) we have special agreements with local restaurants within a very short walking distance (50 to 150 meters). Our rental policy: we try to be as flexible as possible but we are not a hotel neither a bed-and-breakfast. We cannot confirm any stay for one night only. Our costs would exceed our income. Our best rates are available for stays of 7 nights and more. 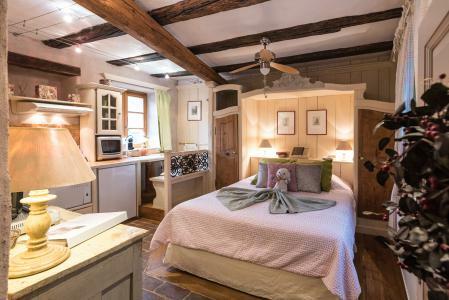 Shorter stays (3-6 nights) are possible when planning opportunities exist and/or when the requested dates come exactly before or after an existing booking (see availability calendars for each gite). 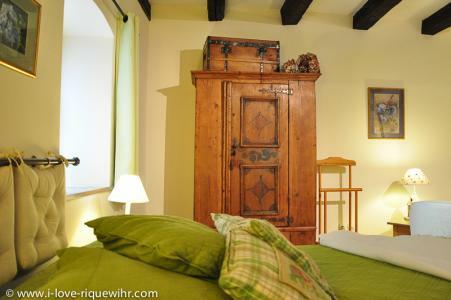 Our holiday gites in Riquewihr belong without any doubt to the finest places to stay in Alsace. Modern top comfort in a traditional Alsatian atmosphere! Book your stay direct with us and get a beautiful apartment for the price of a decent hotel room. "Beautiful and affordable" was the comment of one of our American guests. We offer various sizes of holiday homes. You will find one suiting your needs, wishes and budget. Our holiday homes are inspected by the French tourist authorities. All our gites are strictly NON SMOKING. This means that it is permitted to smoke... outside the buildings only. Broadband internet connection and digital TV available free of charge in our holiday apartments. With your laptop and Skype you will be able to keep in touch with home for free. We have many guests from all over the world, especially from North America, Australia an the UK. We know what they are looking for and what they like. Join our Facebook fans and discuss with some of our previous guests. We have a very professional internet booking system: you will be able to constantly follow-up your booking and stay with us with a few clicks, from the moment you first request an apartment until a long time after you have departed from our place! Bookings are possible a long time in advance, especially for stays during the high season: in Spring, Autumn and during the Christmas period (end of November to New Year). Major credit cards are accepted: Visa and Mastercard. Alsace and the medieval city of Riquewihr are in eastern France on the Rhine River border with Germany. It is unquestionably spectacularly beautiful. Alsace offers a very special combination of history, culture, scenery, and especially food and wine makes it one of the most delightful places to visit in all of Europe. The Lonely Planet’s Best in Travel 2010 has picked Alsace as one of the hot regions in the world to visit. Alsace is one of the most beautiful and distinctive regions of France and is famous for its wine, gastronomy and wine tourism facilities. Joseph Ward, an American wine lover and wine specialist writing for The Washington Post says "Riquewihr gets my vote as France's most beautiful wine town". Riquewihr is indeed the jewel in the crown and looks today exactly as it did in the 16th Century. Riquewihr is also a very practical base to visit all Alsace, the Vosges mountains and even nearby Germany and Switzerland. Park your car and forget about it! 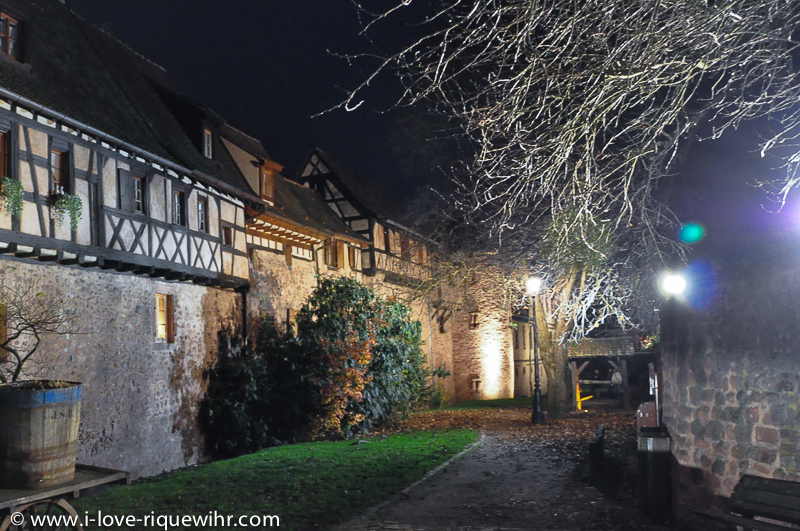 There is more to do in Riquewihr than rushing with the tourist crowds in the main street! Open your eyes, look at the details on the old houses. Explore the side streets. Riquewihr, while being only a village with 1300 inhabitants, is the third city in Alsace for the number of National Heritage buildings (48), just after the large cities of Strasbourg and Colmar! This is the reason why Riquewihr is so popular worldwide. But at the end of the afternoon, when the tourists of the day are gone, you will have Riquewihr for yourself. A very privileged feeling indeed. You will probably need a week or so to discover the main attractions within walking distance or with the local bus. For More pictures and information about Riquewihr, click here. Locate Riquewihr (not Riquewhir or Riquevir :-), Alsace and our vacation rentals on a map. What is the best, quickest, cheapest way to travel to Riquewihr in Alsace? Discover our hints and tips for airports, flights, trains, car rental... To read our suggestions about how to get the best flights and high speed trains to Alsace and the best car rental deals, click here and scroll down after the Google map will have shown up. 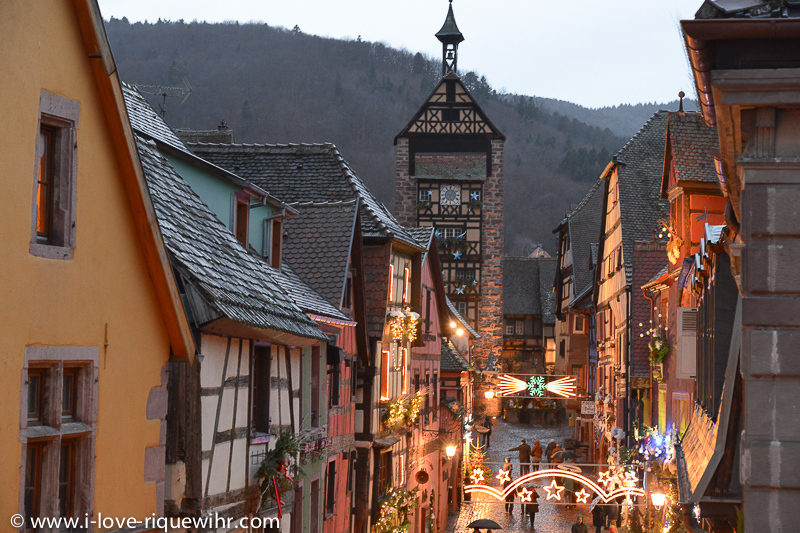 The village of Riquewihr (sometimes wrongly spelled Riquewhir or Riquevir) is one of the highlights in Alsace in any season. 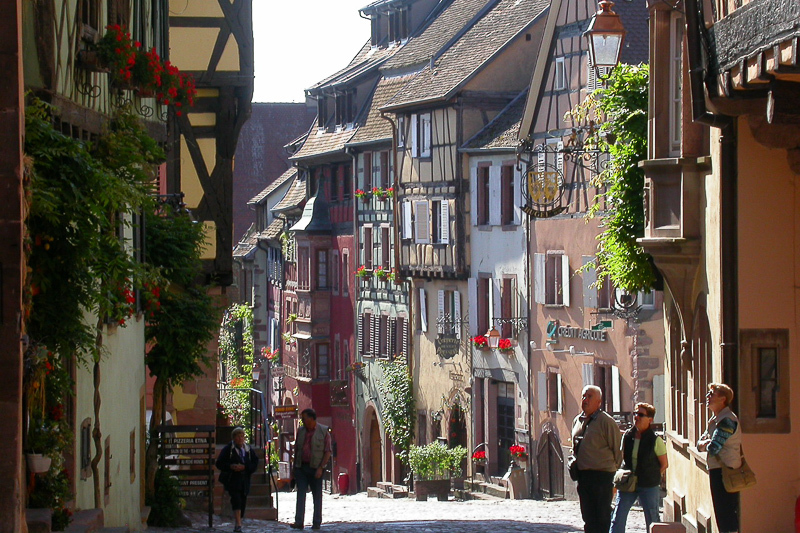 First of all, you will discover the historical and picturesque streets of Riquewihr. The fame of the village of Riquewihr is mainly due to its vineyards which - since the end of the Middle Age - are producing some of the best and most famous white wines in the world... The main street (rue du Général-de-Gaulle) crosses the village and will offer you a festival of gorgeous medieval houses. No, this is not a Walt Disney movie scenery! It is just reality! Left and right, smaller streets will attract you for even more surprises. Step by step you will walk uphill until you will reach the impressive Dolder tower (built in 1291) and the picturesque 'rue des Remparts'. Riquewihr, while being only a village with 1300 inhabitants, is the third city in Alsace for the number of National Heritage buildings (48), just after the large cities of Strasbourg and Colmar! This is the reason why Riquewihr is so popular worldwide. But at the end of the afternoon, when the tourists of the day are gone, you will have Riquewihr for yourself. A very privileged feeling indeed. All our holiday homes (outstanding self catering accommodation) are within the medieval heart of that lovely village. Locate Riquewihr (sometimes wrongly spelled Riquewhir or Riquevir) and surroundings on a map. Most of the highlights and places to visit in Alsace are within easy reach from Riquewihr. 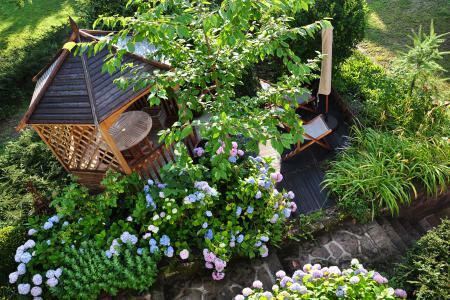 Click to see Alsace and our vacation rentals on a map. Plenty of beautiful pictures, hints and tips about things to see and to do during your stay with us in Riquewihr within a radius of 90 minutes driving and spreading over 3 regions: Alsace, nearby Germany and Switzerland. For centuries, Riquewihr produces some of the most beautiful wines of Alsace and the world. Alsace enjoys some of the lowest rainfall in France (just 400-500mm or 16-20 inches per year) and Riquewihr is right in the middle of the driest area. A superb landscape of vineyards and wooded mountains is protecting this exceptional jewel: Riquewihr. Ramparts, rich residences and more modest medieval houses make Riquewihr the pearl of the Alsatian vineyard and one of the most visited and most beautiful villages in France. Visitors can easily explore the heart of the vineyards in Riquewihr and neighbour villages as Hunawihr, Ribeauvillé, Bergheim, Kientzheim, Kaysersberg..., along one of the many wine trails. Joseph Ward, an American wine lover and wine specialist writing for The Washington Post says "Riquewihr gets my vote as France's most beautiful wine town". We are wine lovers and enjoy excellent personal connections to some of the best local winemakers. We will of course be happy to share our best addresses with our guests. We are wine lovers ourselves, member of the Alsatian Wine Society - Confrérie St Etienne - and we have many winemakers friends in Riquewihr and the surrounding villages along the Alsace wine route. We are pleased to share with our guests some valuable addresses, interesting literature and info in English so that everyone interested in discovering more about wine in Alsace and Riquewihr can find his way and build his own wine tour programme easily. The Lonely Planet’s Best in Travel has picked Alsace as one of the hot regions in the world to visit. Alsace is one of the most beautiful and distinctive regions of France and is famous for its wine, gastronomy and wine tourism facilities. Alsace has been singled out as one of the hot regions in the world to visit by the Lonely Planet’s Best in Travel some years ago. The annual Best in Travel guide aims to give “a collection of the world’s best journeys, destinations and experiences for the year ahead” to “take travellers out of the ordinary”. One of the highlights of the guide is the Top 10 regions which brings Alsace to the forefront. Joseph Ward, an American wine specialist writing in the Washington Post said: "Alsace is a region apart. German in appearance and character but French in spirit and fact, it has captured the best of both". Any questions about your trip to Alsace? Just ask. We will do our best to answer. Subscribe to our newsletter or join our Facebook fans and ask your questions. The village of Riquewihr (sometimes wrongly spelled Riquewhir or Riquevir) is one of the highlights in Alsace in any season. Most visitors start visiting Alsace and Riquewihr already in Spring, when the beautiful and famous vineyards are wearing their first leaves. Alsace Sporen and Alsace Schoenenbourg are the local 'Grand Cru', listed among the best wines in the world. 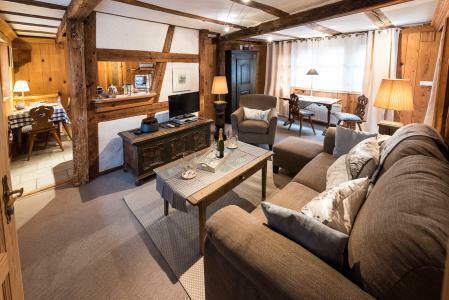 Summer is the time for families or visitors wanting to take advantage of the long daylight to explore the Alsatian countryside and the nearby Vosges mountains. In Fall, harvesting the grappes is another great period, with plenty of festivals and tasting opportunities. Until beginning of November, the vineyards are wearing their golden coat! End of November, second to none, we have the start of the Christmas celebrations. This period of the year is a genuine fairy tale in Riquewihr. The Christmas celebrations and Christmas markets start end of November in Alsace and take place until end of December, sometimes until beginning of January. Finally, Winter - from January until end of March - is the season of traditional Alsace. Mid November, January and February offer plenty of discoveries for those who know how to look and approach closer. 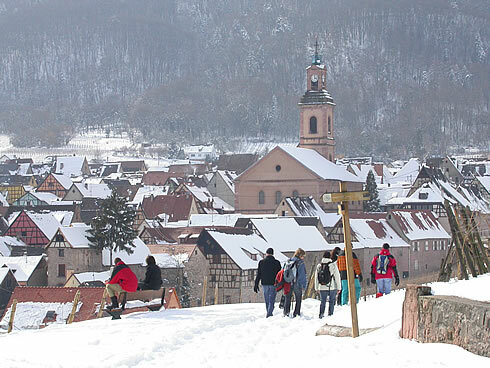 Riquewihr is an uncomparable base for exploring the vineyard, the picturesque medieval villages as well as the mountains of Vosges and Alsace in any season! You will get cheaper rates and meet only connoisseurs. Our wine and gastronomy seminars will take place during this period. 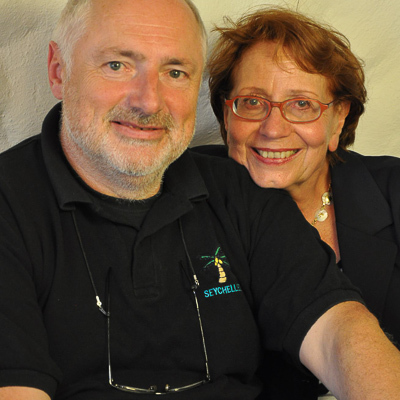 Les Remparts de Riquewihr (Ramparts of Riquewihr) is a small family business founded and run by a couple of tourism professionals - Martine and Jean-Paul - having many years of experience in airline business and travels. We think that - especially for a rather long stay (most of our guests are discovering the slow travel concept and are staying 7 nights and more) - it is not enough to sleep well during the night but it is necessary to enjoy the stay in a place which is somehow of the same level as the historical surroundings, the landscape, the mountain and the vineyards: beautiful. We put a lot of effort and care in the renovation and decoration of our vacation rental apartments because we want our holiday homes to be a memorable part of your travel experience to Alsace and France. IMPORTANT NOTICE: all our vacation rentals are stricktly NON SMOKING. Well behaved children are welcome under the full responsability of the parents. Age restrictions may apply in some of our apartments. Please check descriptions. A credit card print is requested upon arrival to cover damage if any. Spacious luxury gite for 2/3 pers with stunning views in a wonderful setting. In La Vancelle, charming village 25 min north of Riquewihr. Convenient location between Strasbourg and Colmar to visit all of Alsace. 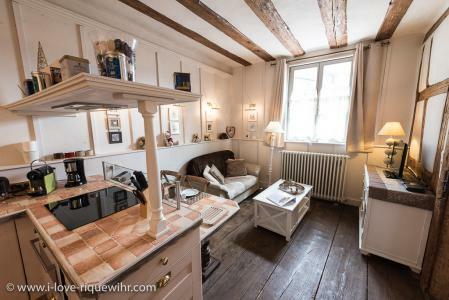 Charming and spacious studio in the heart of Riquewihr. King size bed. Possible as twin beds upon request. Charming, romantic and very comfortable holiday apartment with 2 small balconies. Ideal for a romantic stay in every season. Official 5-star classification APR 26, 2018. Spacious holiday apartment for 4-5 pers, ideal for a family. Beautiful and charming apartment. Ideal for 2-4 people (up to 2 couples in 2 separate double rooms). 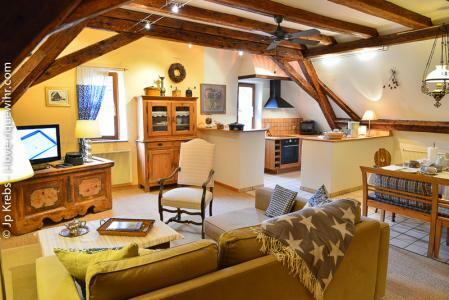 Charming and comfortable holiday cottage in Alsace. 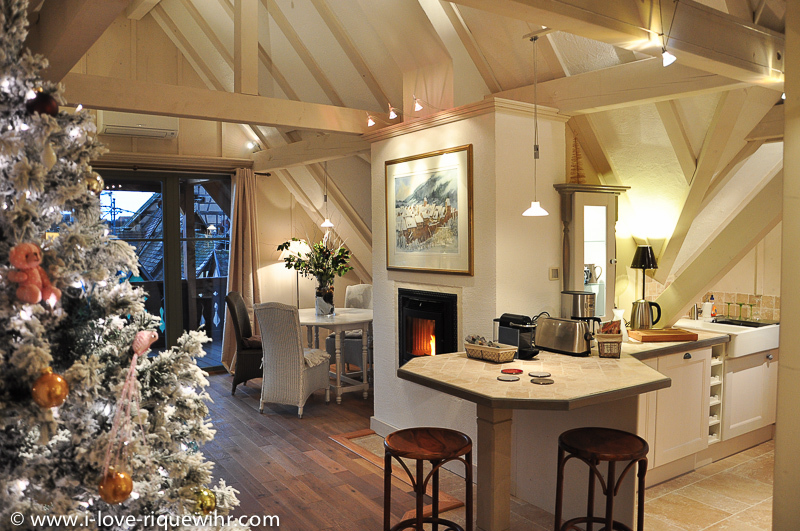 Romantic & luxury holiday accommodation. 2 BR with 2 bathrooms en suite. Just earned its official 5-star classification on Dec 22, 2014. Luxury holiday apartment with garden terrace for 2 people looking for space and comfort. An alternative to the White Sork but with 4 extra beds (1 master bedroom + 2 small bedrooms with single beds). NEW! 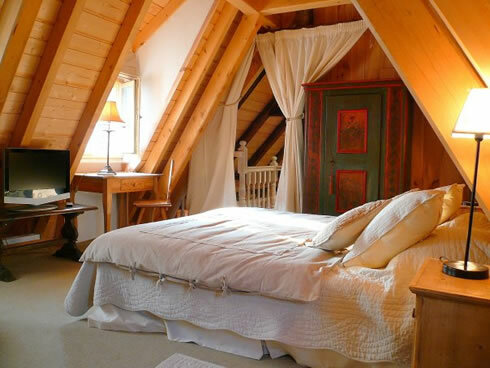 Romantic, spacious luxury holiday apartment with 2 beautiful bedrooms and stunning views. Balcony. For sure our most comfortable apartment for 4 people.